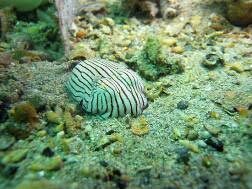 The Striped Pyjama Squid, also known as the Striped Dumpling Squid, is not a squid but a cuttlefish. It is one of the few cephalopods that are poisonous. It is found in the southern Indo-Pacific oceans. It occurs off eastern, southern and western Australia. They can be found on sand and amongst seagrass in waters up to 20 metres in depth. They reach a maximum size of only 7cm! Its arms are short and webbed with small suckers, each with a toothed horny rim..
During the day they spend most of their time buried in sand or mud hiding from predators. At night they become more active and leave the safety of the sand when they go out in search of small shrimp and fish, swimming in short hops.